Reesor's Farm Market is now closed for the winter. See you June 13, 2019 for another summer filled with strawberries, corn & more good things from Ontario. 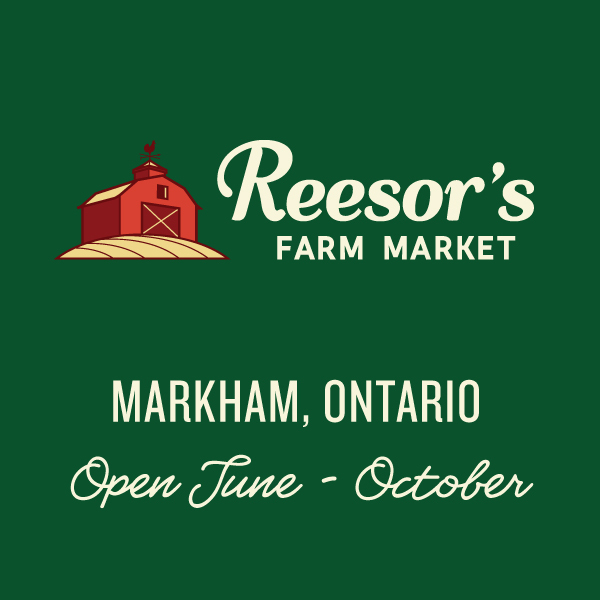 Enjoy the best of Ontario produce at Reesor's Farm Market. Entering our market you'll be greeted by our friendly staff and the aroma of our own pies and cookies coming out of the ovens. Explore the wide range of our other delicious baking, our own take-home frozen entrees (including gluten free), preserves, frozen meats and more. Mon.-Sat. 9am-6:30pm, June to October. Our Farm Market opens in June with Ontario produce and soon after strawberries are ready and we close out the season at the end of October with pumpkin season, and there's lots of delicious local fruits, vegetables and baking all season long. We welcome you to enjoy the abundance of Ontario’s harvest. At our farm market we sell produce from our farm and other Ontario farms, as well as our own fruit pies, pumpkin pies, bread, muffins, cookies (including our very popular Molasses Crinkles Cookies). We offer our own line of frozen foods we make at Reesor’s Market & Bakery in Stouffville, including chicken and beef pies, lasagna, and soups. We also carry plenty of preserves, honey, maple syrup, apple butter, apple cider, organic beef burgers, sausages and more. There’s always something happening at the Farm, so for the inside scoop about what’s in season and what going on at the Farm and Market, find us on Facebook. Molasses Crinkles cookies--one of the wonderful baked aromas coming from our ovens at Reesor's Farm Market. From mid-June to early July, you can enjoy the unparalleled taste of juicy, ripe Ontario strawberries, fresh from the field. You can buy them ready-picked at our Farm Market or go right to the field and experience the fun of Pick Your Own. Depending on the weather, strawberries from our own fields are usually available for Pick Your Own from late June until early July. Create your own family traditions in our pick your own strawberry fields. Our famous sweet corn is usually available from mid-July to Thanksgiving.